Note, October 13: a better, more readable version at 21st Century Wire, that more fully explains the context and implications. with the help of Patrick Henningsen, who added a few points, provided the space, and has promoted it as the important find it is. I'll start with a re-write of some points raised back in 2016, in my first analysis of the so-called "Assad Files," building off of an ambitious piece of propaganda by Ben Taub at the New Yorker. In the article, Taub paints fairly benign statements from government officials as deeply ominous - suggesting this is about what the guys informing him (the CIJA [committee for international justice and accountability]) are also doing. These quotes can seem that way - with lights from below on either side and the background dimmed. 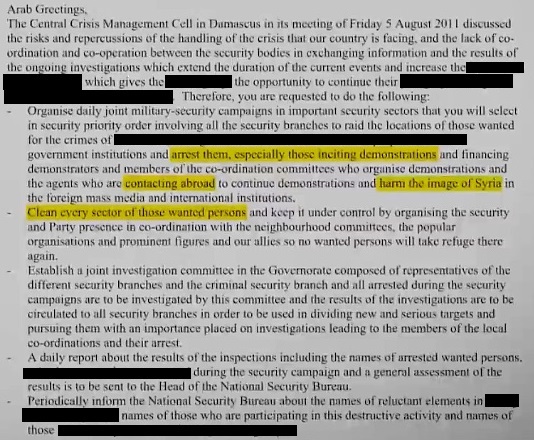 For example, Taub explains, there was a crucial meeting of the Central Crisis Management Cell in Damascus on August 5, 2011, worried about “the laxness in handling the crisis,” which was getting bigger. It's not mentioned here (dimmed background), but this was just a few days after militants overran parts of Hama city on July 31. 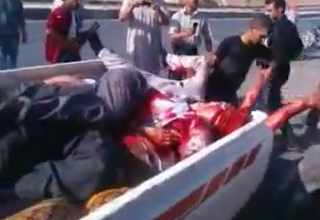 They killed dozens of policemen and soldiers, dumping some in the river early on August 1, throats sliced, cursing the dead "soldiers" and shouting Allahu Akbar. One man asks people not to film, but at least 3 do, and the one vide was published. An opposition activist confirmed this incident to CNN, warning there were Al-Qaeda elements involved after returning from the fight in Iraq, and it might turn their rebellion ugly (or might already have, depending). 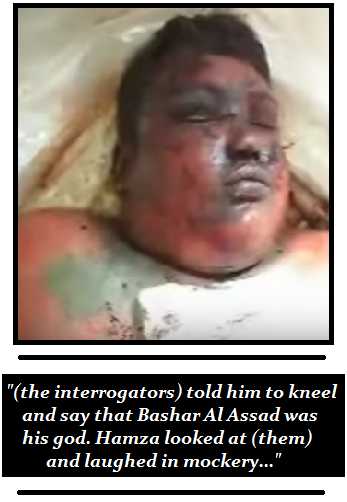 Already back in early June, 2011, there was a massacre by the "Free Syrian Army" in Jisr al-Shughour, claiming the lives of around 120 security members and an unknown number of civilians. Theories were floated that this was a regime crime against those who "refused to shoot protesters," perhaps involving Hezbollah extremists… but it wasn't as clear on that as Hama a couple months later. By August 2011, Syria’s shadowy Central Crisis Management Cell revealed that they were concerned about “laxness” and poor coordination from the authorities dealing with insubordinates. They arranged for regular raids on opposition activists and critics of Syria in foreign media. Their coordination messages paint a clear picture of how orders for what happened to people like Mazen al-Hamada came all the way from the top. They weren't going after any armed groups or anyone else, just people struggling for freedom or smuggling food. Dissent, humanity: shut-down. Militants: ignored? Non-existent? My suspicion then was the parts about demonstrations were really in there, but alongside the real worries about militants running amok, and the two classes might even be linked in a way that makes sense. That's totally not what the memos said, according to the CIJA via Ben Taub and the New Yorker. But I never did trust those assurances. We've still never been allowed a view of any original documents from that August 5 meeting of the Central Crisis Management Cell (CCMC). But now we can see a memo dated the next day and referring to the CCMC meeting in question. Demonstrators, foreign media, wanted persons, clearing and holding areas, and then explanation of the regional investigative committees are all included - and so are all the surrounding parts left out of the painting shown to millions back in 2016. Thanks to an online video from Spanish paper El País, we can see the whole page translated to English, and the Arabic original to a lesser degree, and do some comparison. This is apparently a September fax of an August 18 (forwarding?) 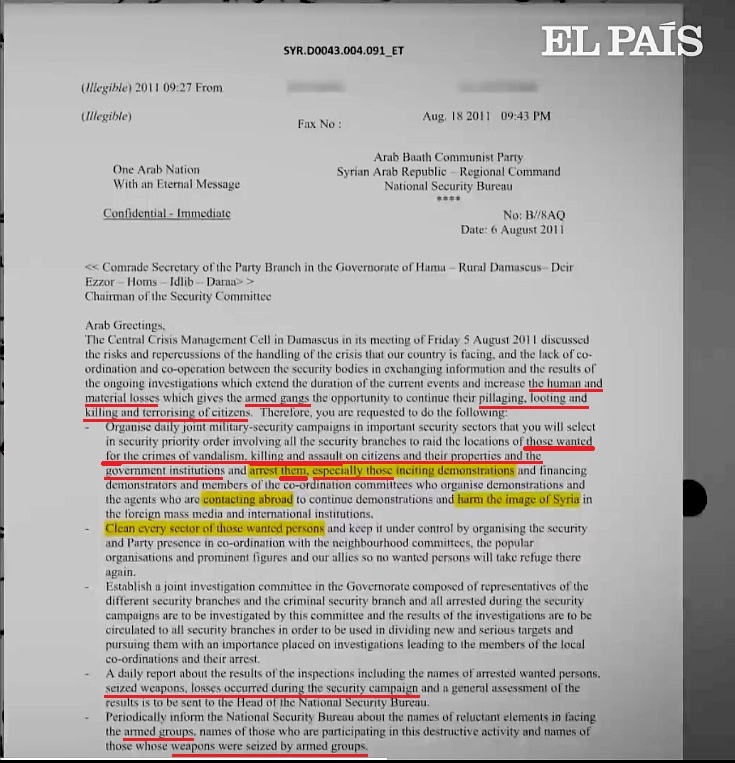 of an August 6 memo, discussing the previous day's crisis cell meeting. It was directed, on the 6th, to regional Ba'ath party branches in the governorate of Hama (listed first), and also of rural Damascus, Deir Ezzor, Homs, Idlib, and Daraa (in that order) - the places the Islamist insurgency had taken root at the time. It also tried hard in Baniyas, but was contained already. Aleppo remained mostly peaceful at this time. But the first one listed here is Hama, which had witnessed the massacre of soldiers and police a week earlier. Yellow highlighted by El País, about the same points early shared all alone. The red underlining added by me shows important points they left out in that process. The relevant paragraph (middle, with highlighting) does mention demonstrations and demonstrators 4 times - at least per the provided translation. But this memo also mentions - as I suspected - "armed gangs" that cause "human and material losses" by vandalism, looting, pillaging, attacking state institutions, and "killing and terrorizing citizens." This all required so-called "security operations" that were expected to incur "losses," perhaps related to the weapons they hoped to seize some of. They also decided some soldiers had a way of losing their weapons to the militants, or being "reluctant" to fully face the "armed groups." These might even be sympathizers, people willing to defect, sabotage things, or kill their fellow soldiers. This is probably the "laxness" referred to in Taub's painted version, but there seems to be a bit more we still can't see. Arrest THEM = people wanted for violent offenses. "Especially those" is a subset of THEM, so violent offenders who also incite demonstrations, etc. However much sense that makes, it's what this translation says. The wording is odd, and raises questions about the translation, which we'll return to shortly. But it does not say go after people who just organize peaceful protests or just talk smack about Damascus. "Clean every sector of those wanted persons" starts the next paragraph by referring to the same - violent militants, and "especially" those organizing demonstrations and smear campaigns as well. So the earlier presentation cut all the red parts above, in their selective quotation of the yellow, just as I suspected. Officials were worried about the militants like they should have been, and it was the main issue. But tt didn't come through in the painted picture of a calm crackdown on peaceful dissent, inviting outsiders to arm the emergent "Free Syrian Army" to "defend the protesters." A total of three documents at least are partly shown in the El País video: the other two have dates and document numbers redacted (why? ), but may be contemporaneous supporting documents. One is an undated request for information, from interrogations and potentially involving torture. Methods aren't explained, but they sought more information from "detainees who incited demonstrations" and also those "who had contacts with foreign bodies," perhaps including "plotters" and/or "bodies which took part in funding and arming demonstrators." Here again, the kind of "demonstrations" they're concerned with involve weapons. They also wondered about the "volume of funding and armaments" going to those "demonstrators" and their origins. So they mean weapons supply, not "arming them with knowledge" or something. 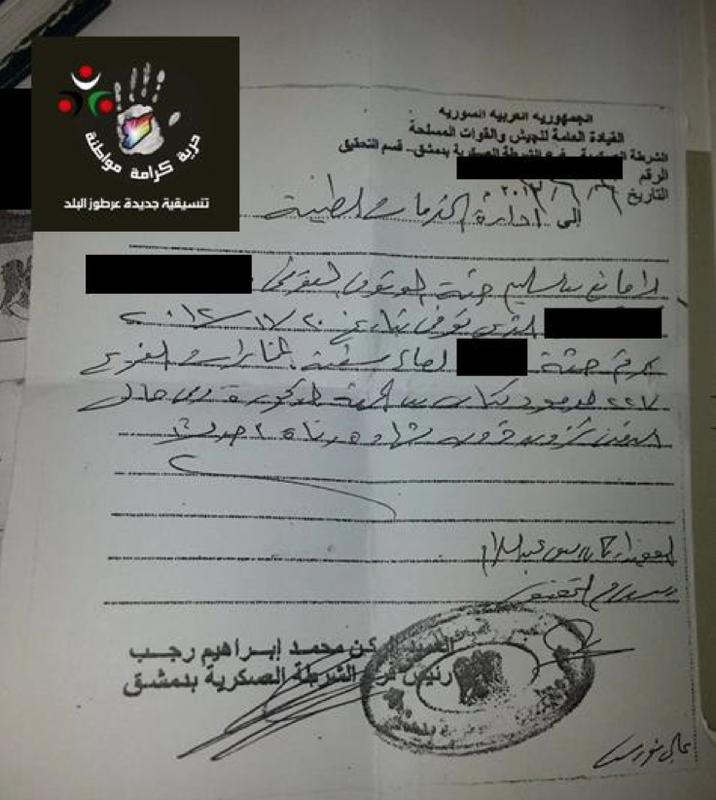 The other shared document is an undated arrest warrant, directed to local commanders in Daraa governorate, asking for the arrest of six people (names removed), as soon as possible. This adds nothing - it's the reason they were wanted that matters. Are they armed militants, or demonstrators and image tarnishers? Above, and left out of news stories, the people were wanted for the crimes of vandalism, killing, and assault on the citizenry and government institutions, and some of THOSE were "especially" wanted for additional media-type activities. Are these 6 just regular wanted, or "especially" so? demonstrations, propaganda, media and "human rights NGO" contacts, and weapons and sectarian mayhem, are all seen with good reason as part of a unified package, a coordinated attack on their country seeking a repeat of the Iraq and Libya regime-change scenarios. Unauthorized demonstrations, at which unauthorized gunmen shoot people and blame the government, was a serious problem. All aspect of such a machine would need shut down. The Local Coordinating Committees (LCC) is named. Publicly, they organize, promote, track peaceful street protests, but they also work with military groups and disseminate their reports, and had nearly every martyr of regime brutality reported with video of the body, as if they had a direct line with the angel of death. The Syrian authorities will have rightly pegged the LCC as organizing both military and propaganda activities. Such people were tarnishing the image of Syria, by committing crimes - often hideous ones -that were being video-recorded and blamed on Syria with great frequency and alarming success. The main translation issue is with what the LCC organize: protests as implied, or a more vague type of "events." See below. There's no mention of arresting baby food smugglers like Mazen Hamada, and no order to implement a baby food embargo in the first place. And still nowhere have we seen any orders to enforce the inhumane conditions on detainees Hamada and others describe, or to systematically exterminate thousands of them, as the "Caesar photos" claim to show. I don't usually presume translation issues without a specific reason - it's quite possible, but the main issue seems to be what's edited out - redacted or just not shared. I found one Arabic translator so far on Twitter with time to help. "the detainees who incited demonstrations and had contacts with ... plotters, and bodies which took part in funding..." In the translation, the "and" becomes an "or" for a more inclusive reading of who's "especially" wanted. But either way, it's the class of crimes they were detained over, and information was sought. More importantly, we get some decent views of the (ostensible) Arabic original of that August 18 fax of the August 6 memo. Below is a full-page view, but small and, as it happens, the important paragraph in the middle is underneath the animated titling for "ARREST WARRANTS." That paragraph is also shown scrolling by larger in such a way all 8 lines can be taken and reassembled (below). "الاشتراكي = Socialist. "Communist" would be written "شيوعي " The name of Syria's ruling party is Ba'ath Arab Socialist, and that's who the memos and translators refer to, so there's no real contention, and it's not a directly important issue. It might show a right-wing bias on the part of the translator, inserting "socialist = commie tyrant" messages in the translation. That might lead to further distortions, but hopefully we can see these directly. With tips from Amin and my own careful looking... here are the words in play for those odd instances of "demonstrations." The usual word for public demonstrations (plural). Also translates like manifestation, display, etc. It does similar in English. It appears zero times in the memo. The singular form is about the same, doesn't appear either. The usual word for demonstrators and/or protesters, ones who participate in the above. This appears where it should, being translated as "demonstrators." Good there. Here's where these words appear in the paragraph. Translated paragraph repeated below for comparison. So far, it appears the translation is ok, despite the appearance. But I still have questions about the wording around the 2 cases of demonstrate, and the LCC's "events", the "especially those..." part, and how the whole run-on sentence here suggests lumping that might be inaccurate (and/or issues, etc.). Such things can tweak the wording to support the reading you want. But mainly, the only way to make this document fit the agenda of the day is to just quote the parts about "demonstrations" and pretend there was no talk of militants at all. Every nation has a right to defend itself from armed insurgency, and the point of this exercise is to prove the Syrian state was way past its rights and had to know that. So the CIJA just cut the parts that disprove their case before they offer a couple stray lines they like as supposed proof. Clearly showing it with minor redactions isn't a good idea (see my effort below). The best plan they took was to present just the yellow lines and pretend that's all that mattered. This point deserves some. I finally asked the author, after noticing he is on Twitter, and how he won the Pulitzer Center's RFK prize for journalism in 2017 for this work "chronicling a team of international investigators who smuggled secret Assad regime files documenting torture and other war crimes out of Syria." It was a dramatic read, but too bad it relies on a dubious alleged witness and grossly mischaracterized documents. So I asked him "any idea how the red-underlined parts here went missing in your article's version of this "linchpin"? It seems to be a plan to stop "armed groups" killing people." (follow-on tweet to correct to "armed gangs.") No response expected, but expectations can be interestingly dashed. Update, October 13: Even with another nudge added, I still received no response prior to drafting the 21st Century Wire version of this story, where I conclude: "I asked Ben Taub about the details missing in his article, but so far he has not responded. It’s not clear if he or – more likely – the CIJA made the decision to delete the militants and distort this evidence. But someone did." 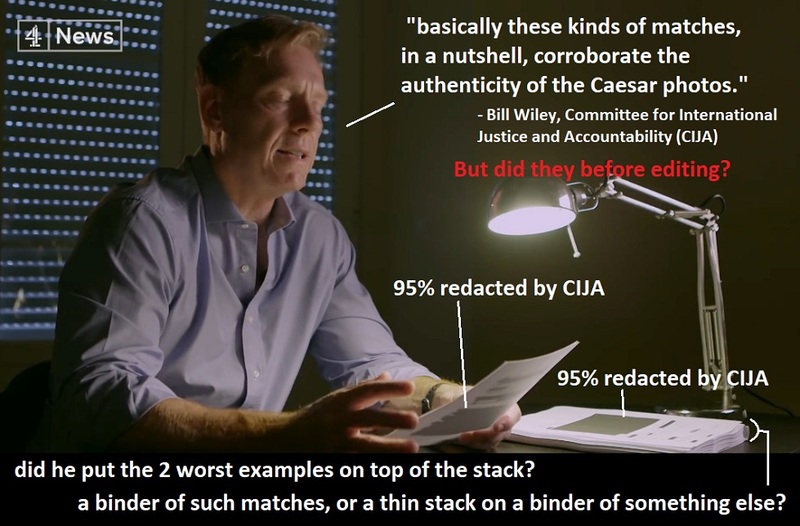 In part 1 I considered what Channel 4's latest (on Youtube) calls "perhaps the biggest breakthrough of all" - a memo that SEEMS to refer to a detainee or "terrorist" who dies and is given the number 2668, and that turns up in the Caesar photos at the right basic time. But with 95% redacted, someone's translation of the rest intervening, and whatever question there is to original authenticity … it's hard to really say how the lines up - but not to CIJA's Bill Wiley. But that was just the most potentially helpful part of what they shared, with three other documents raised to illustrate their case as strongly as possible. This is one more example of at least two found of abuses acknowledged, and in both cases the abuse is denounced and ordered to end. An order to not even beat up the detainees, highlighted as evidence of the cold plan ... TO abuse and in fact systematically exterminate all their innocent prisoners (see below). Or, as Wiley is quick to clarify, such "mistakes" cannot be just mistakes. In a police state like Assad's, they must have been ordered - somehow, he presumes. And these documented efforts to "correct" the "errors" were just too little too late anyway. The arbitrary intensity they ordered a stop and no start to is enough to classify as war crimes, Wiley smirks. Note that this memo, on August 27, comes about a week after "Caesar" says he faked his death and fled with his trove of morgue photos. 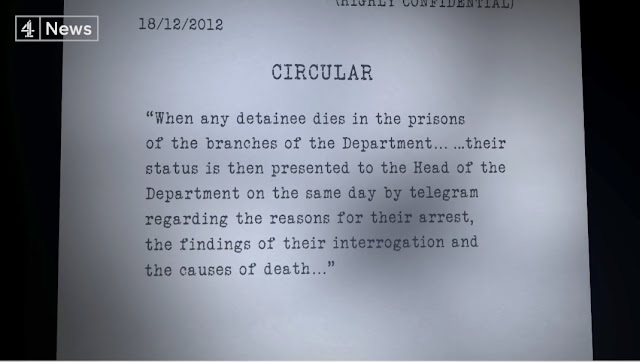 Were they worried he was alive, and would leak their secret torture system? Or that he would leak and misrepresent all those terrorism victims they'd been documenting but keeping quiet about? For good measure, or in a coincidence, they sent out these guidelines at this time. Wiley is salivating at an admission of deaths in prison - plural - and a number that was rising. Was it from 1 or 2 a month previously up to 5 or 10? Or more like 1,000 a month? Unclear. He seizes on their desire to "minimize" deaths rather than "eliminate" them. But jails here with no terrorist insurgency running don't even maintain a 0% inmate death rate, and would hardly bother trying for it. People die, some of them in custody. It's an issue you try to minimize within reason. We're supposed to compare these nicey-nice words to the Caesar photos, having already linked them to this system in our minds, and be aghast at the sick contrast of words and reality. Let's go ahead and compare, but ask - do they even refer to the same things in the first place? Did these thousands of men and boys really die in the jails these guys have some deaths in? You're supposed to presume they did, not wonder about it. But let's go ahead and wonder. 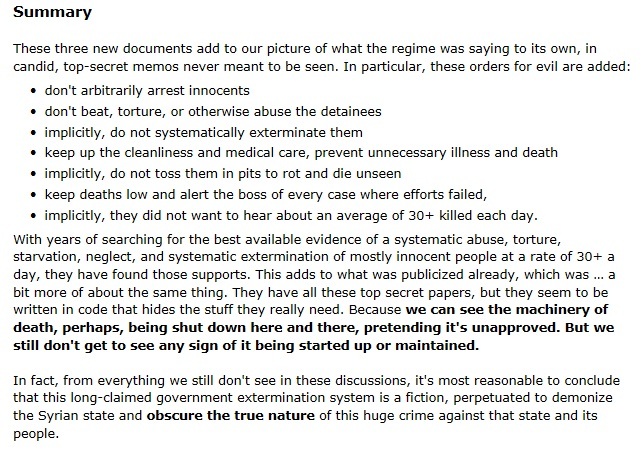 It may not be true, but it is alleged this happened in regime prisons, often in accounts reflecting the photos, as if they really witnessed that all happening - or just saw the photos. Mazen Hamada told the New Yorker how in early 2013, after nearly a year of detention, an infection in his eye was dripping pus. The skin on his legs was gangrenous," and he was "urinating blood" before he was finally transferred to Military hospital 601, which was even worse - a "slaughterhouse" Many activists and supposed survivors have in fact claimed Hospital 601 really was a slaughterhouse inside, people shackled in filth, rotting away just inside before they were dragged out to document. In fact it could be these people are laboring to explain all the things we see in the photos - "yep, I saw that - had that - a guy died from that - "
"According to the United Nations Commission of Enquiry, since 2011 at least five branches of the Syrian security forces have operated wards inside Hospital 601. It was the commission’s opinion that many patients had been tortured to death within the facility." They heard the worst guard in accounts was nicknamed "Azrael, also known as the Angel of Death. He carried a stick laced with razor blades and used this on selected prisoners … took a lighter to a plastic bag and melted it, drop by drop, onto a prisoner’s face until he died." Mazen Hamada says he saw a boy burned in the neck with a blowtorch until he died, just because the boy was from Daraya. The photos agree horrible abuses happened on a massive scale, and occasionally even things that look like those burning episodes. It would be somewhere in the Damascus-Ghouta, area or within body-driving distance of Military Hospital 601. The victims look more like they were held in a medieval dungeon, or a dungeon run by medieval-thinking people. Any of those known to be around? Among untold thousands taken prisoner by Jaish al-Islam and held in such places, an SAA colonel among the few eventually released from their prisons in April, 2018. 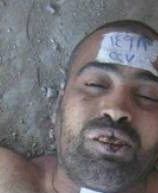 "Abdul Rauf" told the VDC about his time in the regime's prisons, not Jaish al-Islam's. He describes starvation, swollen legs and chronic skin diseases, and this: "one of the detainees who had been tortured severely till his skin was disintegrated, then they put him in the garbage barrel for many hours, and then they throw in the bathrooms corridor "toilet" and his skin was so much rotten with a bad smell out of his wounds , and soon he was dead. … the smell of rotten human flesh because of sores and prevalent diseases and the temperature was very high. ... I think that the number of those who die as a result of the disease is equal to or slightly higher than the number of those who are dying under of torture ." And here the memo says let's keep it clean, keep it healthy, and limit the deaths - the very nerve! Sick sarcasm all throughout … if we're reading it all right. Side-Notes on Jailed SAA "Defectors"
A related thought: In all the prison stories, I still hear no word on the kind of uniforms used. Usually prisons have uniforms. I hear some wore shirts they could spare, torn into scraps to write 82 peoples' names and addresses on with blood and a chicken bone, and they were able to sew this pile of scraps into the collars and cuffs of one of their other shirts, and walk out in it. Uniforms usually get handed back in on release. So it's suggested the relevant prisons killing these thousands just didn't bother with uniforms. I've looked at perhaps all the 6,700 photos, and catalogued about 95-97% of them. All the people I've seen are seen naked or in underwear, usually pulled down by Caesar and his crew, or left in street clothes. 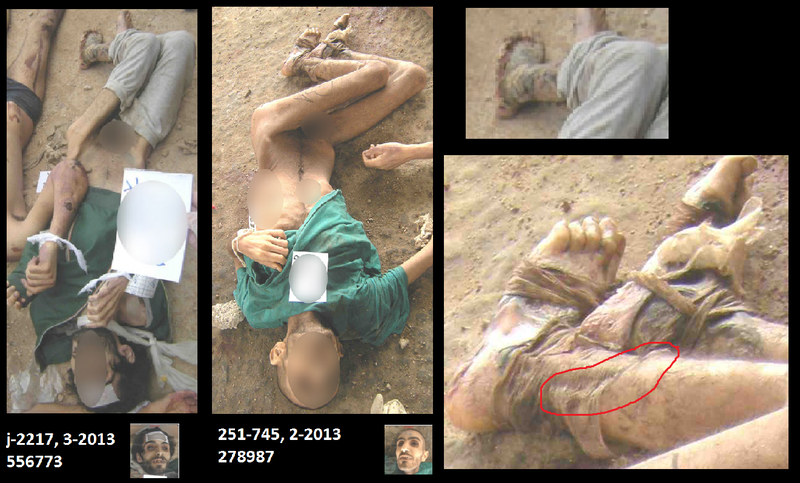 Or military uniforms, like these two prisoners of different branches both killed in or before March, 2013. Not appearing starved, these may be recent captures. Is this FSA? Like, rival of no Islamists FSA? Or is this the regime jailing its own Syrian Arab Army fighters, like the Army of Islam does? In 3 years to do it, still no one has identified these two … defectors? Maybe attempted defectors of the kind FSA guys often found dead after they "refused to shoot protesters"? 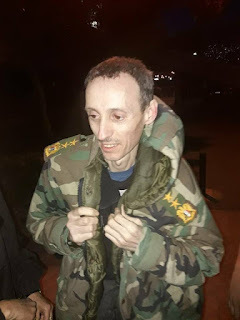 Marwan Abu Anas (a claimed civilian) says he was jailed June 5, 2013 at branch 248 with "nine "soldiers" in their military uniforms and who had been charged with "attempting to defect", and who assured me that they had not had a shower for more than a month." He says he was then taken to another cell with "about 36 people; most of us were either defected soldiers, or those who had been trying to defect." That's from a hard-hitting VDC report that also cites "Abdul Rauf ...with reservation on the detention and release dates and full name for security reasons" This one says he was jammed into a huge cell that had "an area of about 15 x 4 meters and contained about one thousand detainees. Most of the detainees were soldiers and officers, who were charged with "defecting", and their number is more of the civilians, but civilians were mostly charged with demonstrating and vandalism, and possession of arms in fewer cases." Those scare quotes suggest even these opposition guys know those soldiers never did succeed in defecting, probably didn't even try, and in fact may have loyally fought off the Islamists to their last bullet. And still, these soldiers wind up arrested, in some inhumane dungeon, as a large percentage of people held there... how can this happen, if not the way these Abu-Adbul guys describe? Here's 215-3669, and 215-3670, killed side by side before July 7, 2013.The latter at least was also shot, at least twice in the arm, before he was detained at branch 215 and starved down, and finally killed. The tattoo between the bullet holes may be of a relevant man in a suit, but it's not clear who. 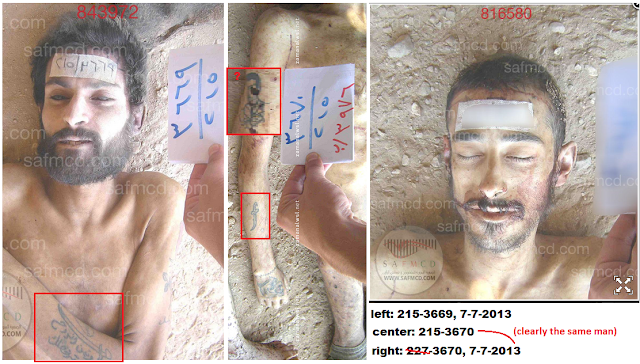 Both men have tattoos suggesting they were Shia (Shi'ite). Did we have many Shi'ite or Alawite or Christian soldiers defecting to the Sunni-Islamist-dominated "FSA" in 2013, and putting up this fierce of a fight before the regime got their hands back on them? No, we didn't. But there are signs of several of them in the "Caesar photos," this one 3670 getting a bit scrambled somehow. There could be many more we don't see the signs of. Even those possible loyal soldiers were not allowed to bathe or have clean clothes. These were washed at the end, but that probably has other reasons, related to their spitting blood despite a lack of fresh bodily injuries... Many will have been sent deeper into neglect and starvation that marks the vast majority of seen victims. But the killing was routine, systematic, and apparently total. Consider branch 227 and 215 - with over 80% of the dead between them - killed every prisoner, in roughly or exactly the same order they were arrested (going by what Caesar says). This is a representative stretch of processed images in my branch 227 folder. Alleged prisoner numbers from 2638 to 2713 are all but a few accounted for, nice and sequential (first in a July 7 folder, then a "000" one, then later in August 14, and it's chronological like this running back to late 2012.). The body discussed in part 1 is included here, highlighted in blue on the right side. I'm still missing a couple of entries, and maybe a few prisoners were spared too? But nearly every number slot filled with a body. As noted in part 1, sources disagree - Caesar and his closest associates and some witnesses claim this is the prisoner number, assigned on arrest or transfer to the branch. This doesn't hold up on analysis, but it's the allegation. The SAFMCD "Caesar" entrusted the photos with, says all these consecutive and chronological detainee numbers appearing on the dead "confirms the systematic murder process of the detainees." Others, including Carter-Ruck and Human Rights Watch, decided on their own, or heard from some limited sources, that it's an order-of-death number, and improve on the allegations by deciding that. 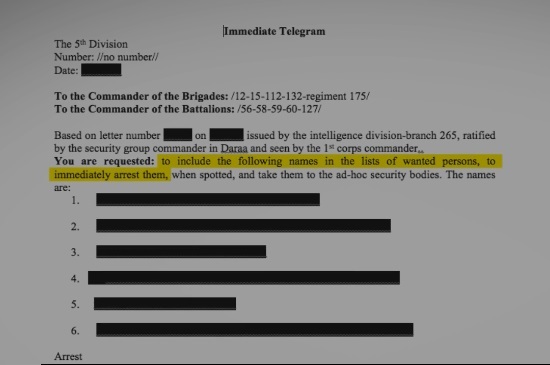 The intel chief's request of December 18, 2012 came just about as this surge of bodies was starting. And he might know of the plan to increase the killing further in the coming months - if it were a plan hatched by his side. Did he really want an average of 30+ updates a day, all marked urgent top secret, to explain the story of each detainee that was killed as planned? How many of these alerts did the commission find? In part one, we reviewed one, then another, and heard there are at least "several." There should be thousands of these alone. Finding one shouldn't be considered a "breakthrough," as that one was. No, this order makes more sense with occasional deaths that weren't planned, and not even of prisoners, necessarily. I mean, IF ya dead or almost-dead bod were to appear, who would take "custody" of them? If there are many, and it has some military-security importance, and requires logging as a war crime, identification, investigation, bulk cases... Military intelligence. But he refers only to the detainees here, not to any of these alarmingly numerous unidentified bodies. I propose he was referring to real prisons run by the Syrian government, not the terrorist dungeons the photo victims were held in. He expected to hear about maybe a few a month or less. An order to keep up on all deaths doesn't prove that option, But it sure as hell doesn't prove the less logical conclusion Wiley et al. have drawn. implicitly, they did not want to hear about an average of 30+ killed each day. With years of searching for the best available evidence of a systematic abuse, torture, starvation, neglect, and systematic extermination of mostly innocent people at a rate of 30+ a day, they have found those supports. This adds to what was publicized already, which was … a bit more of about the same thing. They have all these top secret papers, but they seem to be written in code that hides the stuff they really need. Because we can see the machinery of death, perhaps, being shut down here and there, pretending it's unapproved. But we still don't get to see any sign of it being started up or maintained. In fact, from everything we still don't see in these discussions, it's most reasonable to conclude that this long-claimed government extermination system is a fiction, perpetuated to demonize the Syrian state and obscure the true nature of this huge crime against that state and its people. The hospital number was to cover-up the systematic murder, and link to a false death report blaming - universally - heart attack or breathing stopped. Sometimes they're said to blame a preventable illness. But they never blame neglect or abuse leading to the natural deaths, and they never credit torture or mass execution. After all, they always acknowledge the people WERE held in THEIR jails … or so it's implied. The two earliest entries in the Caesar photos are in the May, 2011 folder - the only two to show how just weeks into the "peaceful protests" and "brutal crackdown", Assad's forces were already torturing detainees. One is a young man - AF intel prisoner j-201 from 5-2011. 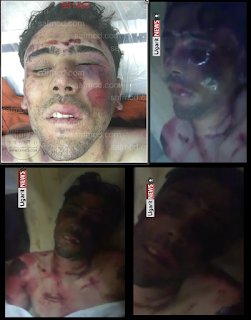 He's been identified as Zaher Ahmad Mubaied, 21, arrested at a checkpoint near Daraya and badly tortured, shown dead on opposition video (wisely, after he was seen in government hands) VDC says he died 2011-06-01 by Detention - Torture, and it lasted over a month. Notes: "He was arrested on one of the security checkpoint on 28-4-2011 while he was going back from Somariah to Daraya, he was torture to death." Interestingly, the only thing we see of his custody is a "Caesar photo" of his body in the government's hospital, with heart testing electrodes (clearly the same lash marks, photo setting). 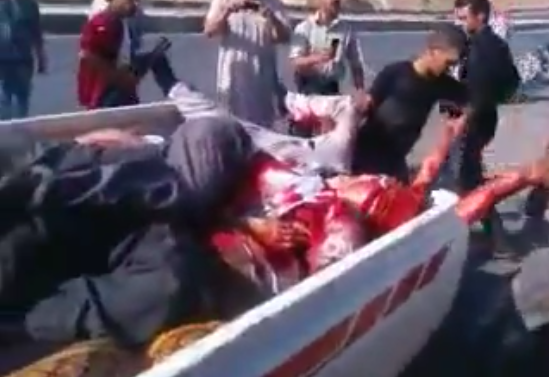 They were checking if he was alive, maybe because they didn't know much about the apparently dead body found and processed - perhaps the first unknown body of the conflict found in the Damascus area. The other of the two is the elderly (72?) 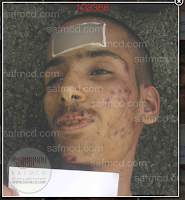 Mahmoud al-Zoubi from Daraa is included as AF intel prisoner #j-000, at Hospital 601 presumably, in May, 2011 folder. This is not the former Prime Minister of Syria Mahmoud al-Zoubi from Daraa, who died almost exactly 11 years earlier, but they may be related. Below, that photo (right) compared to his appearance in a video (left). I made this ID myself from that, and remain totally confident of it. 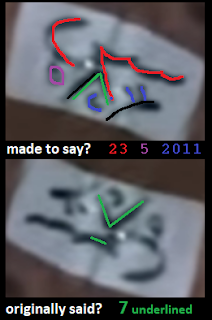 The forehead tape is blurred in the Caesar photos, in a shape matching the area of writing visible in the video. This - apparently - shows he was unidentified body #7, of at least 28 found, after murky events late on April 29 - (the day after Zaher's alleged arrest, as it happens, but in a different area). For some reason this was altered to- maybe just to obscure the implication of unidentified body? The mess here - best anyone can decipher - is a bizarre reading of his alleged death date, May 23, 2011 - after nearly a month of torturous detention. But really, he probably died on the a month earlier, and his body was left near the military housing compound near Saida, Daraa, along with famous boy victim Hamza al-Khatib. Activists claimed Hamza, Mahmoud, and several others were arrested on the 29th from a peaceful protest that was ambushed at Saida. Most or all were order to pray to Assad about a month in, but refused and were killed, then handed back to family the same day. But despite the stories, their bodies as seen on video (nine cases analyzed) clearly suggest they had spent about a month dead, slowly decaying in deep refrigeration. The government detention-torture stories must be untrue. Or, is there some other logical reason for what we see, some "green torso torture?" 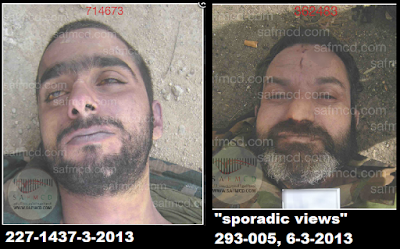 At right is Hamza on May 25, half-green on the day they say he was killed, compared to a clearly false claim about Hamza's heroic last act earlier that day, from a very dubious alleged witness. Anyway, Hamza is not included in the Caesar photos, nor is any of the other 9 victims I recognize, aside from the oldest one, Mahmoud. He's claimed as a tortured detainee with the rest. A video released at that time shows his body, which is one of two that's not so clear on advanced decay (it's possible he died later, or it's just not as evident). The video hosts related helpfully how the sheikh was killed for refusing to accept Bashar Assad as his god. Heart attack due to psychological distress caused by violence and "torture". This is apparently taken as an admission of the detention-torture story that the general decay of the victims proves is untrue. But this probably refers to "torture" by the "terrorists" who must have killed him - and perhaps Hamza, and the others. Reports at the time seemed unsure if Hamza was killed in the gun battle at the housing compound, or in another way, and labored to deny any signs of torture (perhaps wrongly). 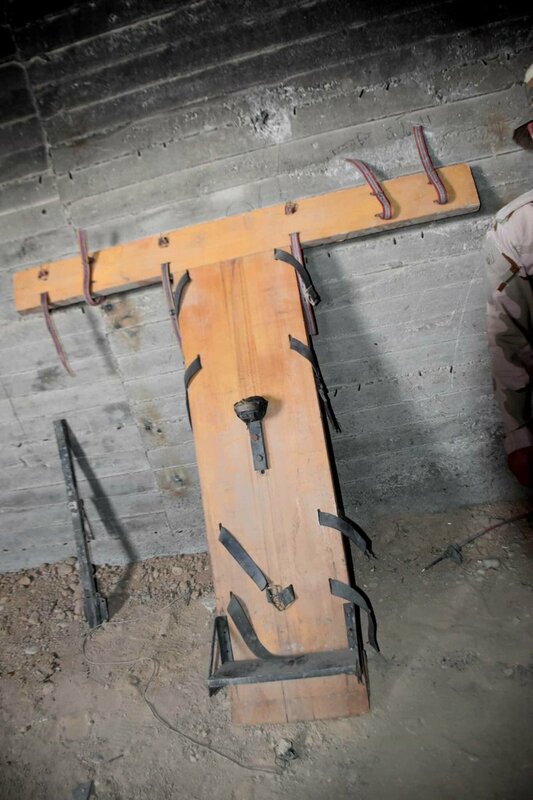 If they did see or note torture on him or any of the others, they would have to conclude it was the terrorists, who then dumped their victims, stripped of ID and probably naked, for the government to process as unknowns, numbered 1-28. This VDC report on 2013 admissions or alerts of alleged death of Branch 227 prisoners from the was interesting reading. In total, four incidents in the Damascus area are covered, in mostly-chronological order. For effect, we'll do it a bit different, with special focus on the second episode. As listed by the same group, and well-informed in a sense, these cover 66 men with murky ends - several who may well be included in the "Caesar photos" as well, and one that definitely is. 14 victims identified -apparently without family help - and their families were alerted. 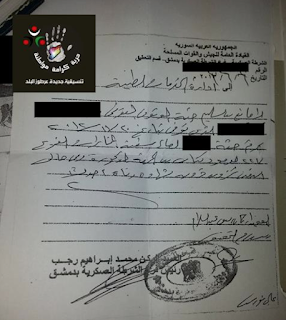 "Members of the leadership of the military police in Kaboun handed over a list containing the names of fourteen martyrs of the sons of the city of Qatana - Damascus, died under torture in the Branch – 227 of military security." As if the list itself said that. But surprise, "When the families went to Kaboun they inquired about the cause of death, but the members of the military police responded that the causes of death were different, including heart attack, angina, and denied that any of them had died under torture." Those tricky devils. "When families asked about the whereabouts of the bodies to receive and bury, members said and literally "they are in Tishren Military Hospital, go search for them there" It's not clear if they did so, or just how much of that is true. 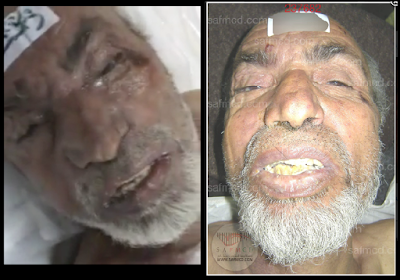 - Ayham Ahmad Omran was identified in 2015 in the Caesar photos as 227-415 (1-11-2012). "a 25 year old single Petroleum Engineer, who was in prison before under accusation of humiliating the national feeling and conspiring to overthrow the ruling regime." In June, there were notes citing as unspecified disease caught in the 227 prison, Jdaidet Artuz area many similar cases were recorded in Branch 227, including a number of Christians and Palestinians, Activist "Abu Asi" a member of a Jdaidat Artouz coordination said in his testimony to VDC." 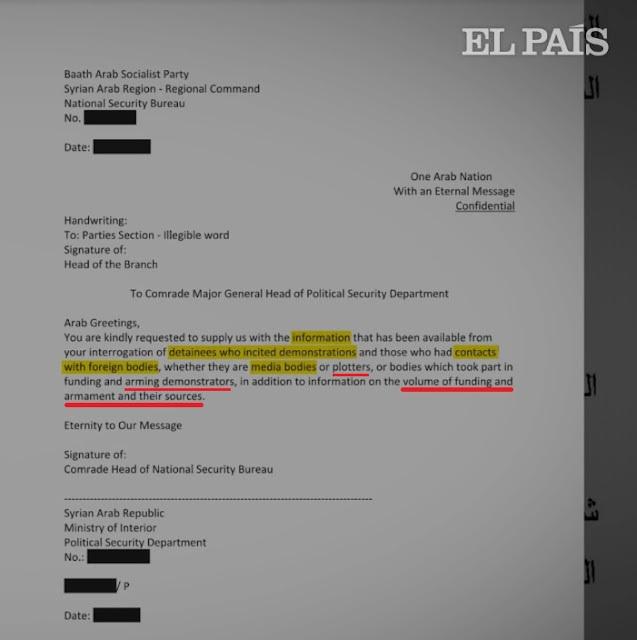 He says "the last time on 06/20/2013 municipality delivered some of the names to mayor "Ibrahim Adarir", the info "included in addition to the names of the victims, a number of the body, and also the cause of death of alleged to be some diseases in Branch 227 - Damascus." VDC lists 10 share a note to this effect, listed June 5, 6, and 20, all from the Jdaidet Artuz area. They weren't fooled by the disease talk, and list them as dying from torture. Two are named Marbia, one a taxi driver and the other probably not. This happens frequently. It's not clear how, but perhaps the mobile one is caught first, and the other is taken in only after a phone call to bring cash quickly... It's said the bodies were not handed over, just their things. VDC has 10 Christians listed that way and also as tortured martyrs. In Jdaidet Artuz, two such, working as workers somewhere, were killed or listed the same day in this span, 2013-05-18: Fadi Yousef Lutfy, 32 and Eid Nizar Tarben, 36. Not much detail given. They're not on the above list as dying from illness, and the branch isn't specified. Also listed, out of our scope but interesting: Emad Anton Khabazeh, a Christian taxi driver up in Aleppo was listed in July 2013 as "martyred under torture in the Political Security branch in Aleppo after his arrest on charges of cooperation with the FSA / / / Christian" That's how solid the Christians were against Assad. And the guy was tough. They tortured and tortured, but never did get any info on who he was helping to sneak across the Turkish border - voluntarily of course. Consider a Zaman al-Wasl (Lebanon) report on Ahmad Shehadeh Shanwan, a taxi driver from Damascus area, taken and killed by Air Force intelligence, on an unclear trip between Homs, the Jordanian border, and the Shia-majority Damascus suburb of Sayida Zainab - "voluntarily as is its custom in late 2011." It sounds like he was detained closest to Sayida Zainab, which is near Daraya, Artuz, these other areas around the west fringes of Damascus we're considering. The VDC apparently doesn't list him or any relatives as detained or killed (I tried for Arabic, different spellings, areas, etc. and even found a near-matching clan, Shahin, but their Ahmed seems to younger, and an "FSA" fighter), but Zaman al-Wasl ran the pic, got an ID, and lists 2 brothers also detained. The photo they published for Ahmed appears in the Caesar photos as "anonymous (unknown) branch" 648 1-7-2012. Analysis suggests he has no known prisoner number, and is unidentified body #648. Back to the VDC report: one man they heard from claims he was one of those taken in then from Jdaidet Artouz in these days Abdul Rauf, 26, "with reservation on the detention and release dates and full name for security reasons," related all about the horrors at a couple of different prisons: "everyone was standing on his feet, and we slept while standing. ... Beatings was on a daily basis, especially beating on legs "Falaka"... swollen legs and chronic skin diseases, … one of the detainees who had been tortured severely till his skin was disintegrated, then they put him in the garbage barrel for many hours, and then they throw in the bathrooms corridor "toilet" and his skin was so much rotten with a bad smell out of his wounds , and soon he was dead. … the smell of rotten human flesh because of sores and prevalent diseases and the temperature was very high. ... I think that the number of those who die as a result of the disease is equal to or slightly higher than the number of those who are dying under of torture ." June 9, 2013: Biological Warfare Massacre Averted? In another case on June 9, families were invited to claim somehow identified bodies, but the VDC heard the bodies were "rotten and contagious because of the disease spread among the detainees so the families were afraid to go there because of that disease and the [fear] of getting detained , the bodies are still there and we don’t know what happened to them." (for this they list 20 men from a few families from Qadam). This letter makes no mention of disease, torture, or anything as to cause of death, but they do seem to know the death date. And it refers to a "detainee." (I don't suppose the word used can be ambiguous?) The letter says they have "no objection" to returning the bodies, but somehow this didn't always happen. In these cases, it never seems to. May 31, 2013: The True Story? “Two days or three before the second list of names, news leaked among the families that there is a new list contains many of names of martyrs who have died under torture, and the detachment of military security in the Katana is the source of this leakage, but the families did not take it seriously, where they thought they only broadcast terror in the hearts of activists." Were the officials really the primary source for these rumors? That's presumed, but other parties might be slipping tidbits they shouldn't know, themselves having some interest in terrorizing some people in their areas of attempted control. Right? "Martyred in the regime's military police's branch 227 (district branch), the families were informed of the prisoner's death through the municipal office by the military police members, the martyr's personal stuff and ID were handed to them, but the bodies are not yet received by the family." Families went the detachment of military security in the city asking about the reason for the death of their sons, the answer of detachment members was as follows: "You know the terrorist armed groups kidnaped them and killed them." This is something I can totally see them saying, something that I suspect is the truth. The Syrian side has been quite silent about the possible content of the photographs (see here), aside from an early statement by the Syrian Ministry of Justice that the photos showed "unidentified persons" killed in the foreign-backed violence. Some were militants killed in clashes, they said (few if any of those I've seen look like that), and others were "civilians and military personnel who were tortured and killed by the armed terrorist groups because of their support to the state." A vest majority of those I've seen do look like they could be just such people. 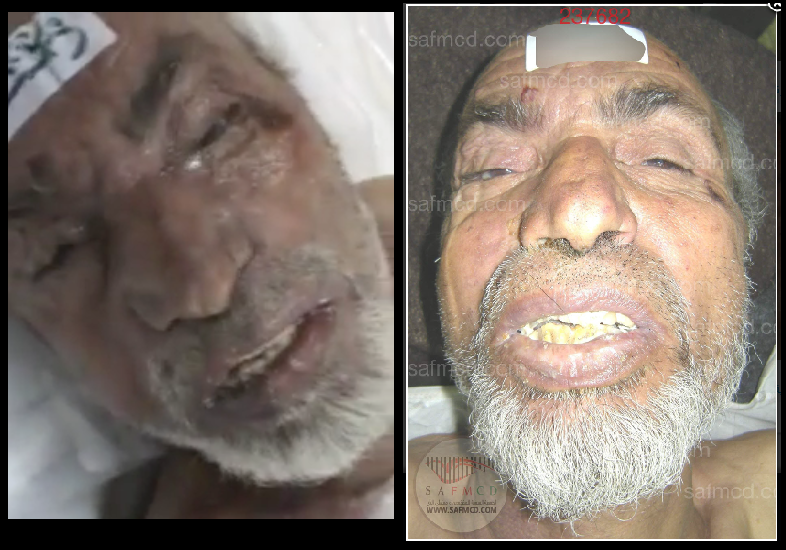 - Mahmoud al-Sheikh: age 68, photo. Notes: "Known as (Abo Abdo al-Mondalan),Arrested on 1/5/2013, he is the father of the martyr Rasheed al-Sheikh, Martyred in the regime's military police's branch 227..."
- Khaldoun Abdo Shuqear: Arrested on 1/10/2012). 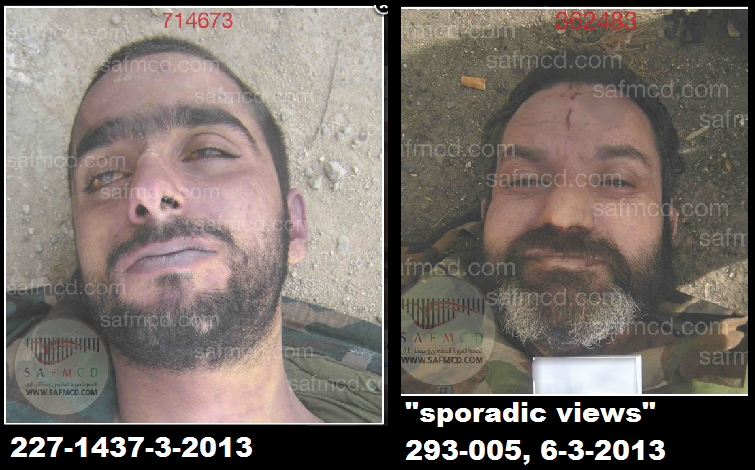 From the ID card and previously reported ID, I can be sure he's also included in Caesar photos, as disappeared detainee 227-663, 1-11-2012. He has (unidentified body?) number H#2538 (from another photo I have - no need to show here). Recall another Shuqair was reported killed on March 24, just taken in in February. It's not clear how the authorities belatedly attained these four ID of men from the same family, other than from their relatives. But here, they know first and alert the families. Did someone who knew the case even better give them a belated tip? - peaceful, promising, known activists who reject Islamism and militancy: this keeps the Islamist militants off the hook, and makes the turn to violent Islamism that favors them seem to be "Assad's fault." - young, old, chubby, disabled: no threat, but killed anyway. This proves the mindless evil the growing and decreasingly opposed armies of Islam are up against.